Soak up the sun, chill out and be pampered in style. Each villa sits on 204 square meters (2 Are) of land with 139,5 sqm of building size, and are designed to be your very own oasis, complete with their own private pool, tropical garden, air-conditioned bedroom with king size bed, kitchen with pantry, air-conditioned living room, dining area and en-suite bathroom. 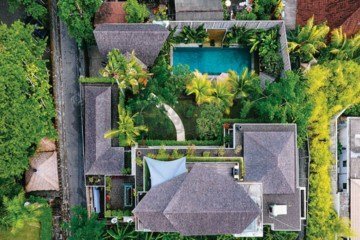 It is a secret, secluded hideaway located in the heart of Seminyak, the most sought-after destination on the island to shop, dine, party or simply to chill out and relax. Situated only 30 minutes drive from the airport, steps away to fashion boutiques, restaurants, nightlife venues and within easy distance to the beach. Airport: Bali International Airport (DPS) – 20 km (30 minutes drive).